Mt Sentinel towering over the University of Montana. After reading our previous post you know all about the history behind the race and who will be toeing the starting line. Now lets talk about the actual course. 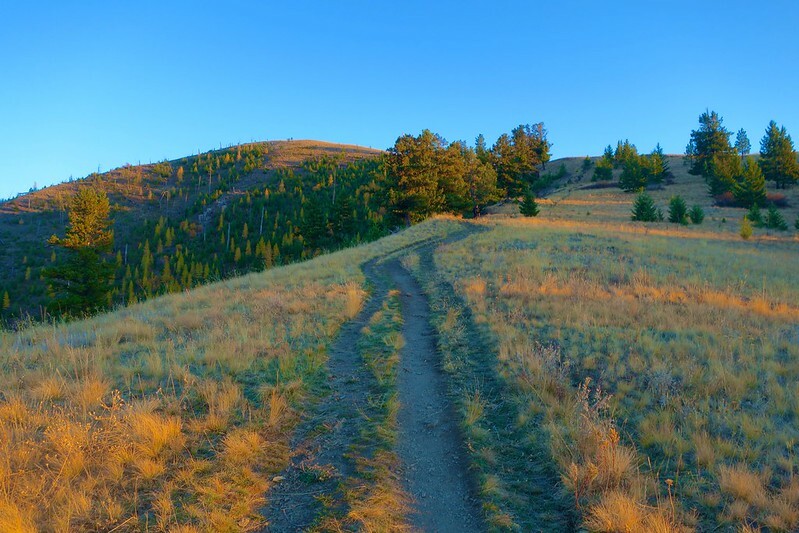 There are only a handful of trail races that let you decide which route you want to take and lucky for you the Mt. Sentinel Hill Climb is one them! Ok, let's keep that excitement bottled for a minute while we take a deeper look into your options for Sunday. Before we get into your personal preference of pain and trail surface, lets take a look at the facts. 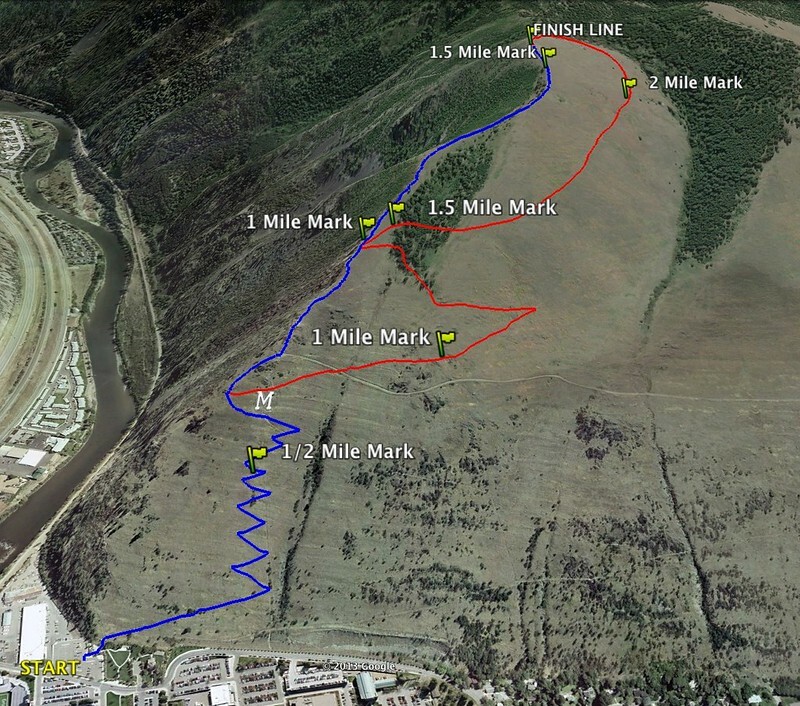 Above is a GPS layout of the course with both options mapped out for you (i.e., the North "Ridge" route in blue and the South Route in red). Below are the elevation profiles for each route. If you elect to take the Northern Route you are looking at a total distance of 1.6 miles, 1,934 ft of elevation gain, an average slope of +23% and a max slope of 51%! If the Southern Route is more to your liking, you will be facing 2.4 miles with 2,135 ft of elevation, an average slope of 18% and a max slope of 37%. So now that you've got the numbers, what should you do on race day? Well that depends on your preferences for trail surface, scenery and pain! For those of you who enjoy a solid, compact trail surface, like to keep the legs ticking over and don't mind the extra distance and elevation gain then the Southern Route is for you. 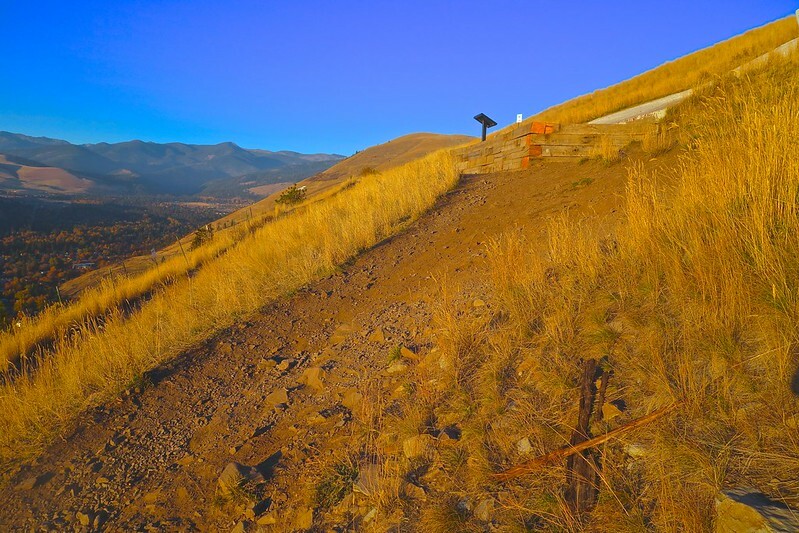 If you live for challenge, don't mind loose dirt and rock in your shoes and aren't afraid to hike or walk when you hit that 51% slope then keep left after the "M" and try your luck on the Northern "Ridge" Route! No matter which way you choose to go on race day, your journey begins in the same place. Let's imagine it is Sunday and race day is here. You woke up your in own bed (nice), ate a light breakfast, put on your lucky race day gear, rode your bike to the start (awesome) and RD Mike Foote, who hates Sentinel repeats, is barking instructions at you. You look back at your family one last time, who are supporting you but quietly thinking "glad its not me running up that thing", as you prepare mentally for the oncoming roller coaster of excitement and struggle. Everyone nervously tucks into the long line that is now pointing upward towards the summit. You're running through your strategy, checking your shoe laces and all of a sudden we're off... Immediately your nerves calm and you start to think about this course preview... wait where was the North "Ridge" turnoff again? Now you're steadily ascending the easier slopes of the "M" trail, you find that perfect gear and you settle in with what seems like a good group. Several runners have tore off the front, they must be crazy, while others are quietly humming along behind you. 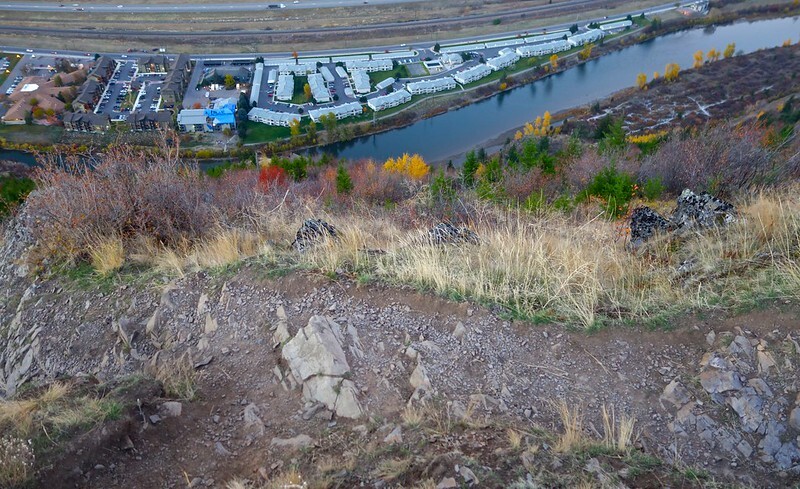 You're focusing on foot placement because this section has many sharp, awkwardly angled rocks that can catch even the most hardened trail runner (see image above). On the turns you enter wide and then cut back sharp but not too sharp because those metal poles are unforgiving! Just like that, your past the half mile mark and you're starting to feel the climb in your legs as you sneak views of the runners zig zagging behind you. You've reached the point now where we all start searching for that metal sign post that sits right in front of the "M" but its still several switch backs up. So you put your head down and keep climbing, you'll be there soon enough. The newly built benches seem like a great idea but you avoid them because you want to make it the entire way without stopping. Smart decision! Why make this any longer than it has to be, right? The Final Switchback before the "M". The Metal Sign Post is Actually a Map Donated by the 2012 UM Senior Class. "M" Trail Sign Pointing to the Sentinel Fire Road Just above the "M"
This next section is critical to your race experience so pay attention. You've now climbed up over the "M" and you notice something odd. The other racers in front of you are going in different directions. 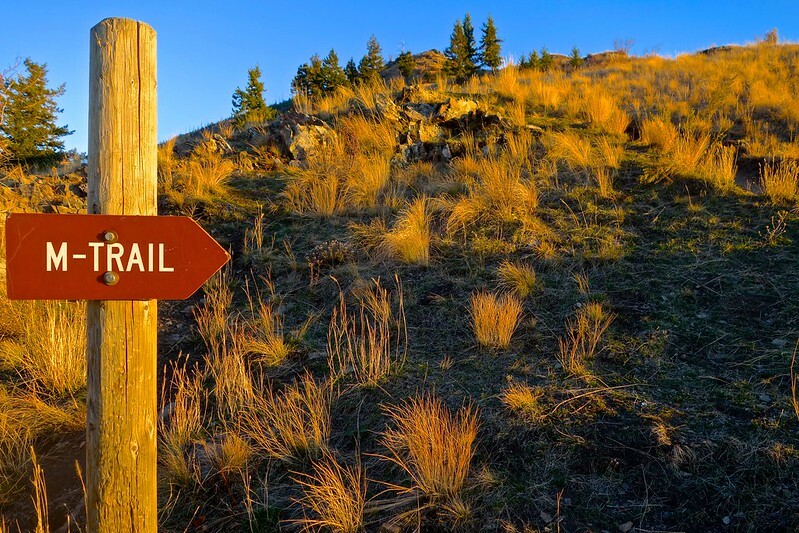 Despite the growing inward fear that you are lost, you think back to this post and remember that this is the critical trail junction where you must choose between the Northern and Southern routes. The beautiful weather coupled by your eight hours of sleep and 2 shots of espresso encourage you to go for the Ridge. Gutsy, I like your style! Now it's time to focus. So you've committed yourself to the shorter but steeper route, nice, there's no turning back now. You're focused and looking at the rocky, narrow trail about 3 feet in front of you, scanning for rocks and turns. 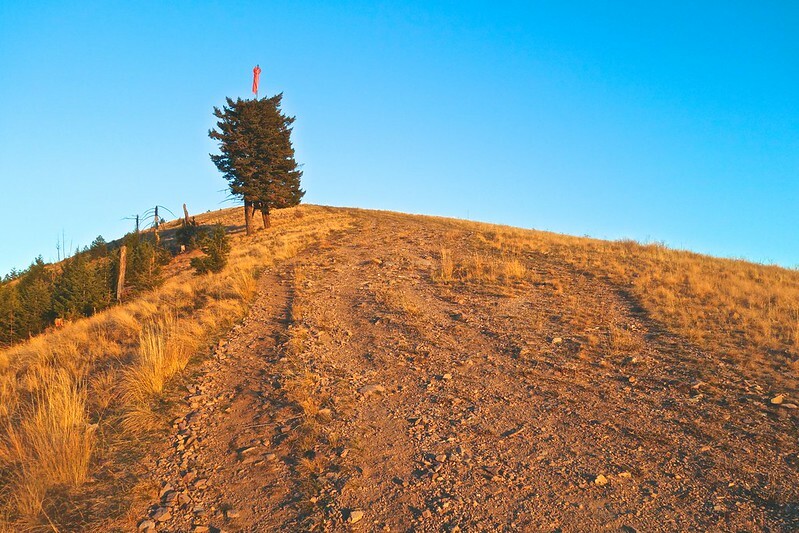 Yes, there are some gnarly climbs just ahead but you're not worried about them right now. Keep reminding yourself that this is what trail running is all about. This definitely hurts but its kind of fun! 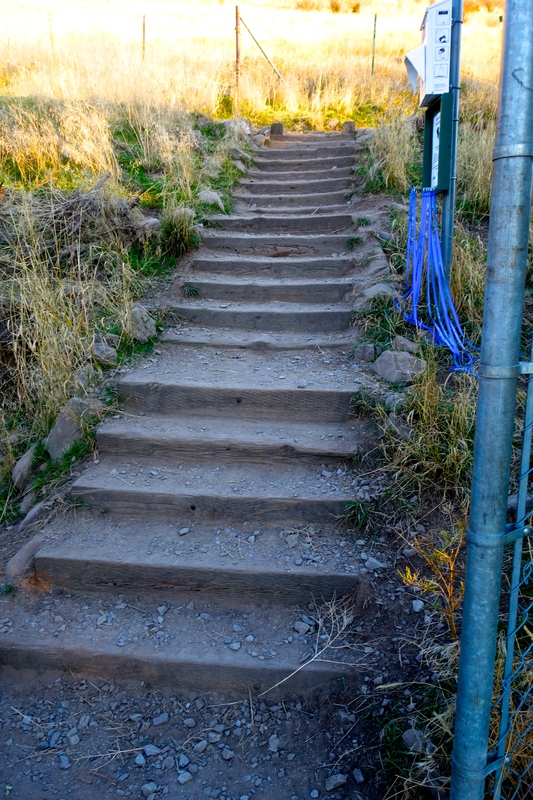 Now you've made it over the first of a series of unbelievably steep climbs and your confidence is up. The trail is technical but you've got it today. 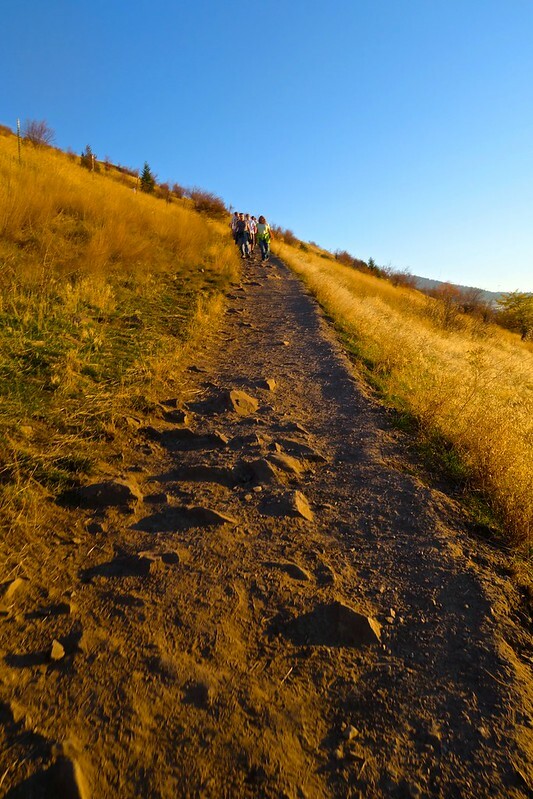 Even with your new found confidence, you are still cautious because there is still 3/4 of a mile to go and there is a rather steep drop off to the Clark Fork on your left! Steady. The race has really spread out now. You just passed a few of the runners who gambled on the all out sprint to the summit strategy and of course there's that guy who has been right behind you since the start. Even your best surges just can't seem to shake him. 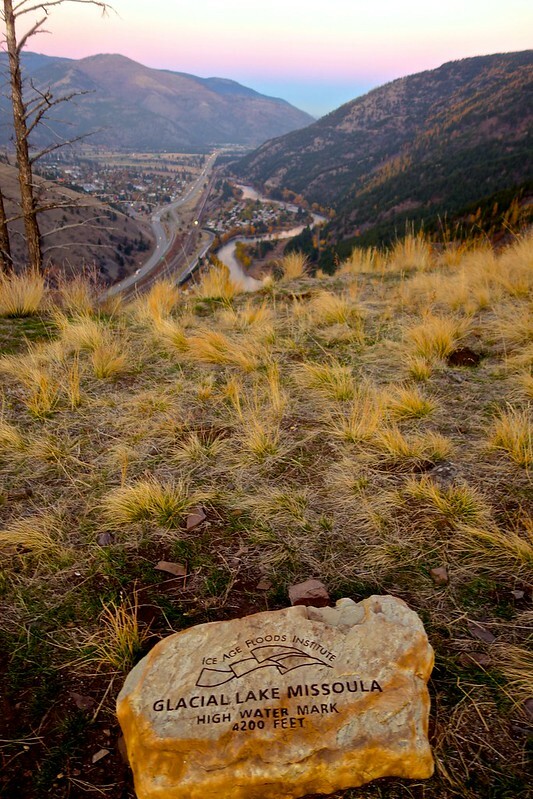 Don't worry about him, focus on finding the Glacial Lake Missoula rock to your left. No reason why you can't take in a little history on your way to the summit. Section 2 is rapidly coming to a close now. 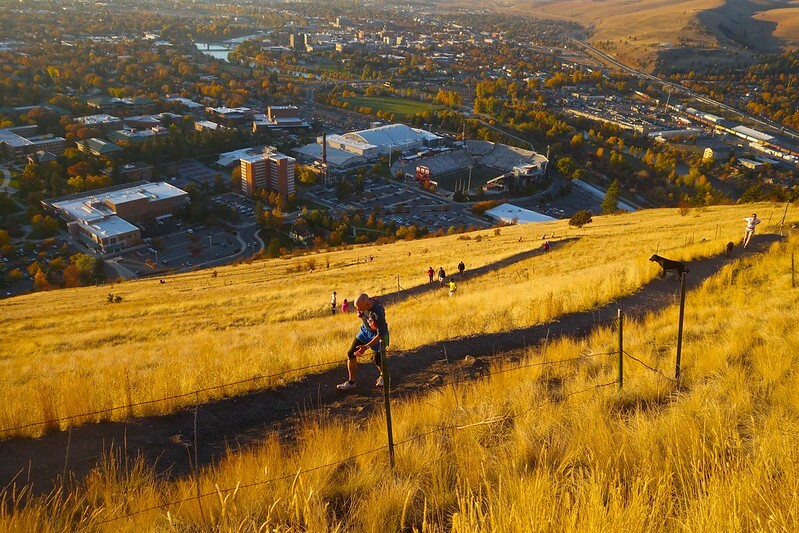 Sure you've had ups and downs, sprints and walks but you made it over that nasty 51% slope and you're now preparing for the very runnable section to the finish. Don't be confused by the runners to your right snaking in and out the trees. They chose the Southern Route.. do not, I repeat, do not follow them into the trees no matter how tempting that beautiful, soft single track looks as it gently cuts into the canopy. Less than a half mile to go! Mt Jumbo looks so small from up here, God I love this place. You've earned this view so certainly take it in but don't linger. Remember, the last section is where you are going to pull back that group in front of you and finally break free from that stubborn guy who is breathing heavy behind you. Yeah, he stills there! 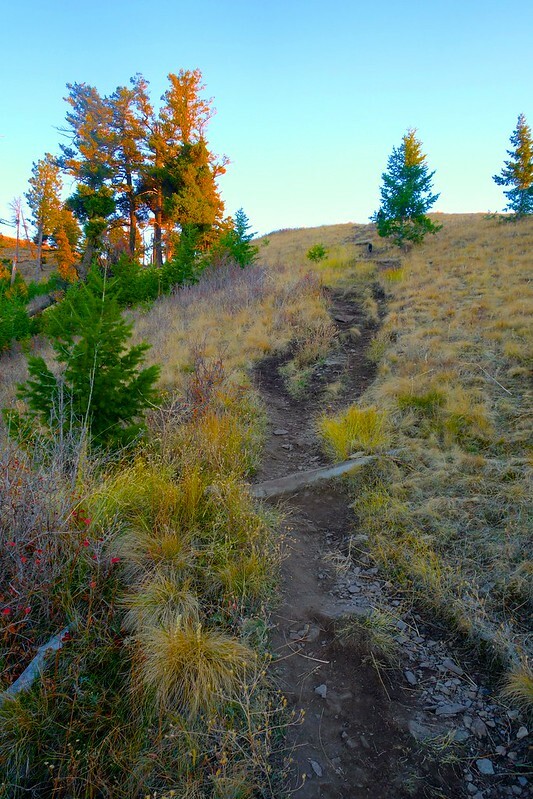 The trail now looks more like a jeep road than single track. You have been patiently waiting for this semi-flat section to begin your final push to the summit. If you squint you can just make out the inflatable finish line arch that someone from the Runner's Edge drove all the way up to the summit...nice touch guys! Well, that little push paid off. You passed an entire group of runners and you're still holding that last gear for the final pitch to the summit. Remember to watch out for the water bars on this last steep section. 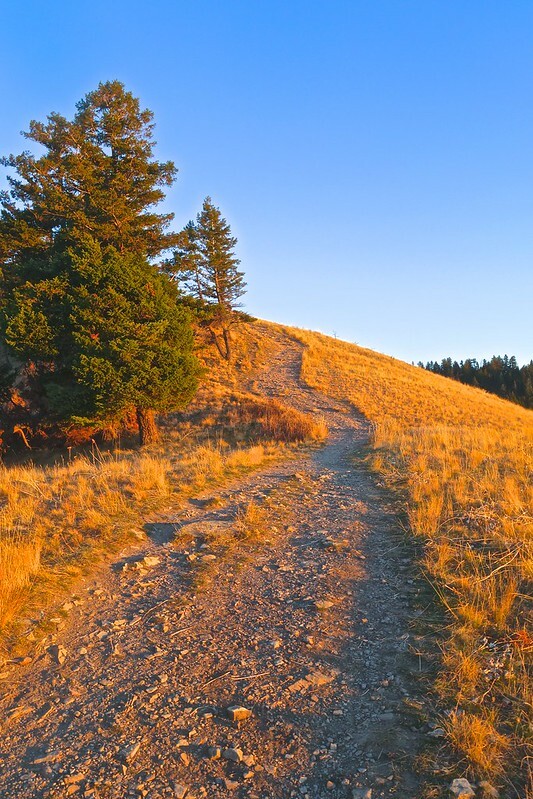 Also, don't forget to enjoy the narrow single track here because this is the last of it. Ah yes, the final turn to the home stretch. There is a beautiful view just off to your right, of the jagged Bitterroots, the snow capped Lolo Peak and the distant peak of Cha-Pa-Qnn but you don't look, instead you climb hard to the left. So close! Yes, the Wind Sock, finally! You now have undeniable proof that the summit is just a hundred yards or so away. The trail really expands here and the overlapping braids can be a bit awkward. Pick a straight line and stick to it. You swear you can hear voices up ahead but you still can't see the finish yet. Time to throw caution to the wind and explode into that that last gear you've been saving. 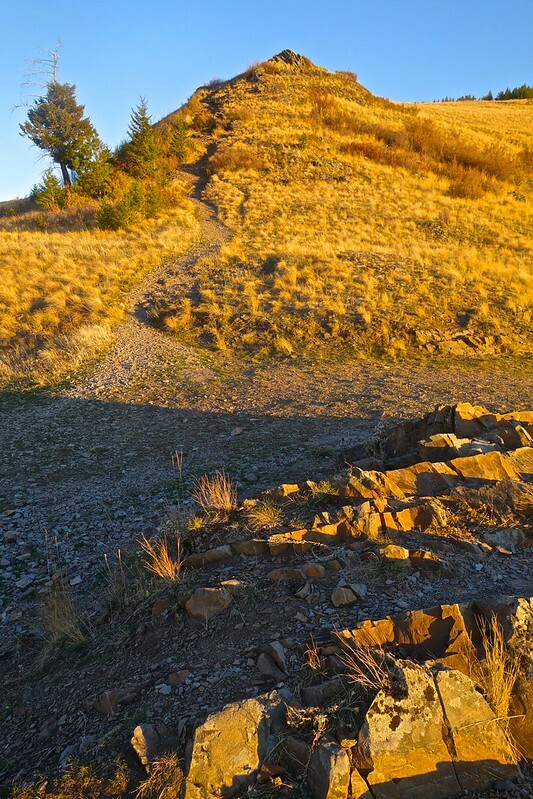 Don't be fooled or discouraged by the false summit here, there is a little dip and then just a short climb to the finish! 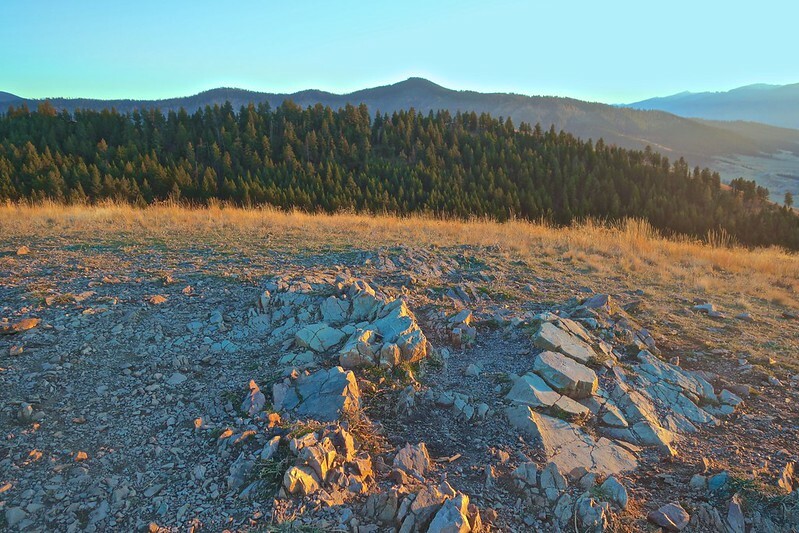 The Summit of Mt Sentinel. You Can See Mt Dean Stone and the Bitterroot Mountains off in the Distance. A group of runners are excitedly cheering for you as your approach the now swaying, inflatable finish line arch. You catch a quick glimpse of the finish line clock as you hit the summit and hunch over to collect your thoughts and breath. Congrats, you just finished the 2013 Mt. Sentinel Hill Climb! A sense of achievement sweeps over you as you snag a water and banana and gaze back down to the valley floor. 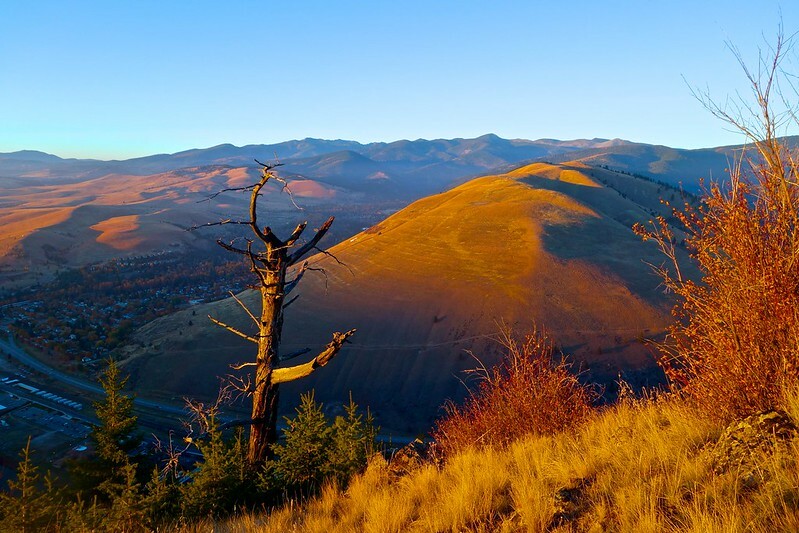 You gather with friends on the summit, share that all too familiar story about how you almost face planted off the side of the ridge and then come to the inevitable conclusion of this race which is "how do I get down now?" 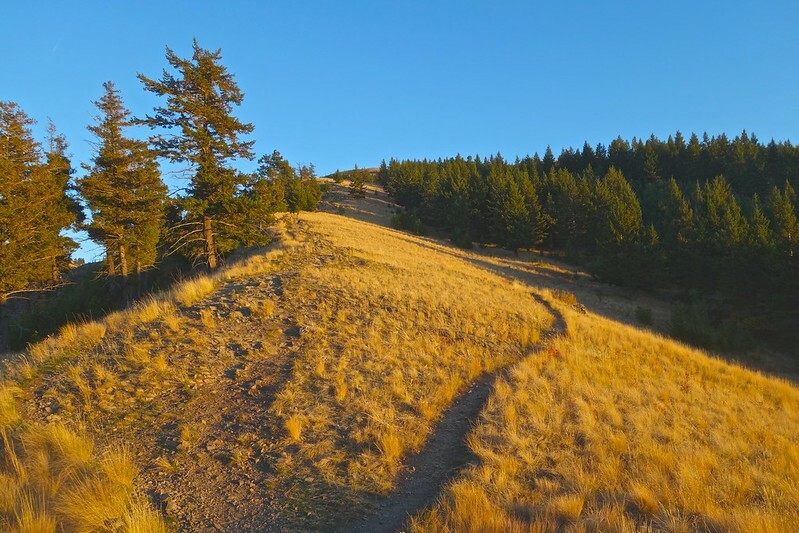 Personally, I recommend the Smokejumpers trail as it will be covered in ice soon until next June and the grade is just gentle enough for a nice cool down back to the Kim Williams and the awards ceremony. Just think, most Missoulians are still sleeping on this cool, crisp Sunday morning but not you. 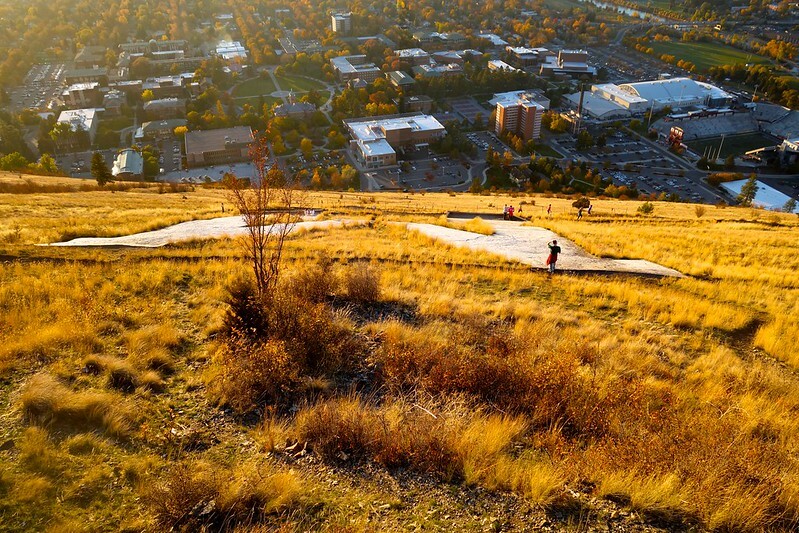 You chose to climb nearly 2000ft up Mount Sentinel to support the UM Tri-Team! 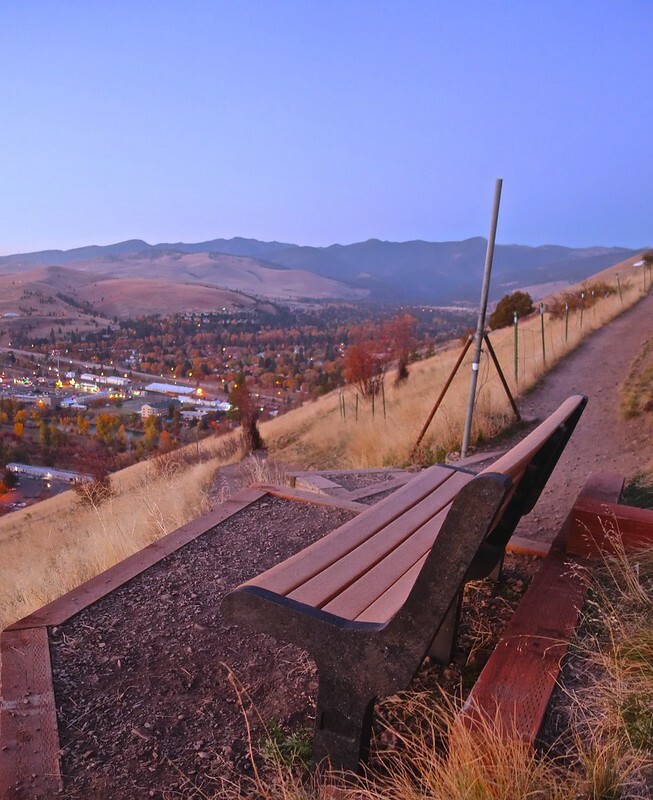 Even though you are tired, hungry and in desperate need of a jacket you can't think of a better way to spend a beautiful Sunday morning in Missoula, Montana!